They used Amplitude to quickly identify personas who engaged in a particular set of surfaces more than others. MyAnalytics and Workplace Analytics are a family of new products within the Microsoft Office 365 offering to help information workers spend their time more effectively. MyAnalytics provides experiences that are embedded into Outlook, a dedicated web app, and a weekly email that is sent to users. The team needed to understand how to effectively engage its users across multiple surfaces to help its users be more productive. Using Amplitude, the lean team within Microsoft was able to see that their users have a varying frequency of engagement with each surface. 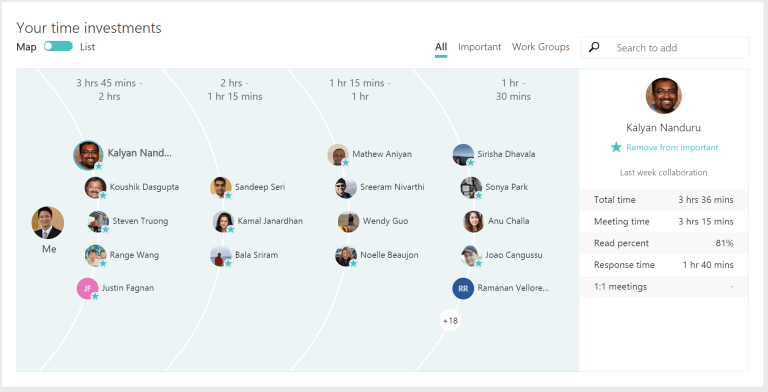 The team defines engagement as a user completing tasks that help improve their own productivity such as booking time on their calendar to get things done, declining unnecessary meetings or catching up on missed important mails. They used Amplitude to quickly identify personas who engaged in a particular set of surfaces more than others. Using this data, the team made strategic product changes to promote more engaging features. It has helped them build more habitual use to increase retention and impact. Amplitude allowed the team to enable deeper and faster explorations into AB testing results of feature changes that were geared towards increasing engagement and impact. An example of a feature change Microsoft tested is in the simplification of user experiences. The team removed barriers like first run experiences and less important interactions to get more users to easily complete important tasks that increased retention such as exploring insights or booking time to focus. Top level view of different actions users take within MyAnalytics. The team has learned a lot since using Amplitude. Amplitude allowed the team to not only improve engagement, but also to measure and correlate productivity gains with the engagement of new features. The team is constantly discovering better ways of engaging users and have re-prioritized features that were more effective in changing user behaviors or saving users time. It has also learned that users are not looking for new apps. They want a more streamlined experience in existing apps to help them improve their productivity.